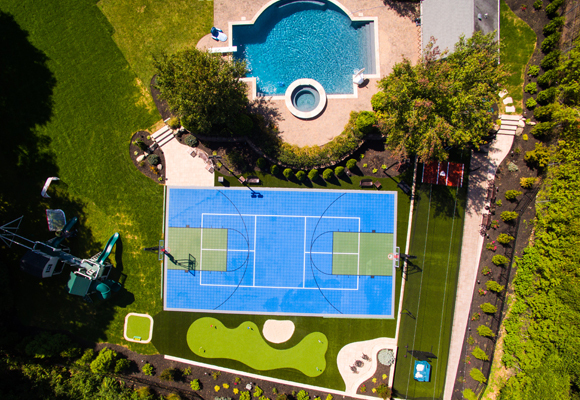 A family with young children presented Tour Greens the opportunity to "Bring the Fun Home" to their backyard by creating this complete practice facility. Whether the kids will be stars in the future remains to be seen, but with a Tour Greens practice green, a multi-sport game court from VersaCourt and a batting cage complete with XGrass sports turf, they have the tools they'll need to succeed. Tour Greens Practice Putting Green with 5 holes, sand trap and chipping box. VersaCourt game court featuring a small full-court for basketball and a pickleball court. Batting cage and surrounding turf featuring XGrass synthetic grass.